Davey is an amazing guy and an even better softball player. He is encompasses all of the traits of a FitAfter45 Weekend Warrior. “I was born in 1947 on a farm in Tomahawk. It is here where I learned to work hard and enjoy life, simultaneously. In the summer time, I used to go down by the railroad tracks, get a bucket of rocks and a sturdy tree limb and would just start hitting the rocks- which is what I think may have helped me later in life! I moved to Minneapolis, Minnesota in May of 1964. I was in my early 20s when I got a chance to play softball (we still had wood bats and I loved it). I had the opportunity to play on some great teams. In 1979, I got a chance to go to the Major World Series in York, PA, where we finished 4th out of 70-something teams. Later that year I relocated to Miami, Florida. In 1981, I got a chance to go the Worlds where we finished 4th. In that year, I even made All-American which was quite an honour! Thereafter, I moved onto 35 and over where my team won 4 national and 4 All-American titles. I just kept going from there! 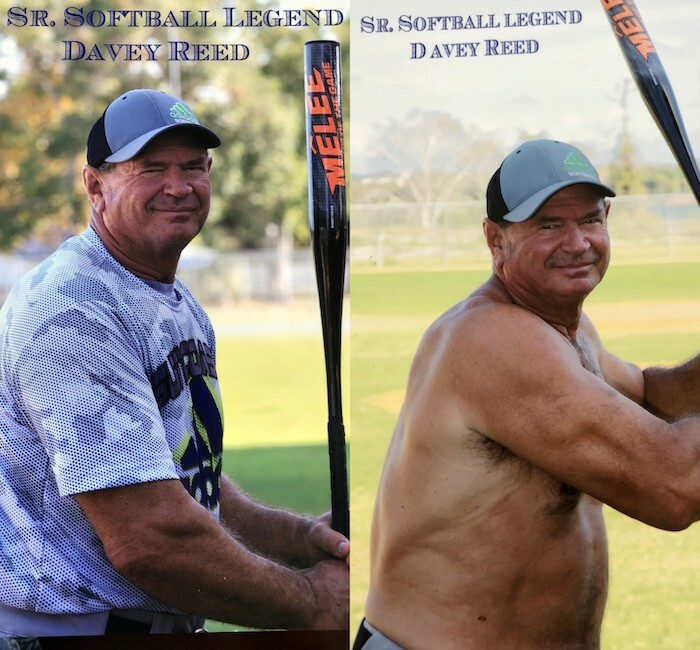 I moved to 40 and over, won 2 upper and 2 lower nationals and made All-American in each of them. Now, 50’s Ball is where I seem to have hit my stride. Years of staying consistent really paid off- I won over 100 national tournaments, 75+ All-Americans, and 5 Hall of Fame honours. I also became a certified fitness trainer which I thoroughly enjoyed as it gave me an opportunity to help others. From there I became a pro staffer for Adidas sports and got the chance to travel for them! I helped build a bat called “The Legends of the Game”. They put my name on it along with three others- quite a thrill. I also do powerlifting and have set 2 world records in the deadlift; one in May 2017 at 402lbs at 70 years old weighing 220lbs and in November of 2017 at 407lbs at 70 years old weighting 220 pounds. My life after 45 has been amazing. Believe me when I say so much can be done after 45! My wife, Judy, of 52 years has also set a world record in the bench on her 70th birthday at 132lbs! Aging doesn’t have to mean you slow down. You can accomplish great things before and after 45. I loved playing all of them. I had a basketball hoop on the side of the barn where I would practice my shots. I would throw a rubber ball against the barn wall and run to catch it. When I started playing softball, that practice growing up really helped. What are your top 3 fitness tips for the post 45 athlete? Remember, after 45 we start to lose up to 40% of out ability to perform if we don’t stay active! Flexibility will prevent tears and pulls. Balance will save you from falling which could prevent you from many unwanted injuries. Strength training helps keep your muscle mass in order to product your bones and tendons from injury. Bonus Tip: Proper hydration and foods that are heart healthy are also essential for maintaining good health. I started at a later age and found myself lagging behind. I did my best to stay consistent and continued to get better and better. My best years have been after 45! When it came to becoming a trainer, obtaining the certification was quite tough. It required a lot of studying; learning about the body and how it works. I had been lifting since I was in my 20s and it all fell into place! For the advanced 45 athlete who has plateaued, what advice would you give to get them to the next level? Gains come harder and slower after 45! Don’t try to rush the process. Do your workouts on a steady basis and change them up every week. Be patience and you will see results, just don’t give up! What is your #1 injury prevention tip? 50% of injury comes from overuse. Warming up before your workout is critical. Stay flexible and keep your balance. using a foam roller really helps when you are warming up or cooling down. What 3 supplements provide the most bang for your buck for the post 45 athletes looking to maximize their performance in the gym? I am not much of a supplements person as I believe you can become too dependent on them. My best advice would be hydration! Our body is 70% water so of course, we rely heavily on it. Drink water before, during, and after your workout. Proper, clean food is also necessary. Maintain a good ratio of carbs, fats, and protein in order to achieve optimal results and feel your best.